News media reports of agricultural injuries and fatalities can fill an important information gap and provide near real-time, humanized stories for safety professionals and policymakers who are focused on the future of agricultural health and safety, according to research published in the journal Injury Prevention. There is no central repository of agricultural injury data, and federal childhood ag injury surveillance has ended. However, researchers at the National Farm Medicine Center are building and testing rural health informatics tools to enhance the collection and dissemination of publicly available injury case data from news reports. Authors Bryan Weichelt, Ph.D., National Farm Medicine Center, and Serap Gorucu, Ph.D., of Penn State University, highlighted data collection and its safety implications in their article, “Supplemental surveillance: a review of 2015 and 2016 agricultural injury data from news reports on AgInjuryNews.org,” available at http://dx.doi.org/10.1136/injuryprev-2017-042671. At the heart of the research is www.AgInjuryNews.org, the largest publicly-available dataset of its kind, built by the National Farm Medicine Center, Marshfield Clinic Research Institute, Marshfield, Wis. The review of news reports revealed that tractors were the most common injury source (fatal and non-fatal) across all age groups, 32% of the 1,345 victims. The leading injury source among the 225 youth victims (ages 0-17) was all-terrain vehicles (33%). “We continue to see new and innovative uses of this growing dataset by many audiences beyond academia including insurers, lenders, manufacturers, and other agribusiness interested in the success and longevity of ag operations,” said Weichelt, principal investigator of the AgInjuryNews initiative. 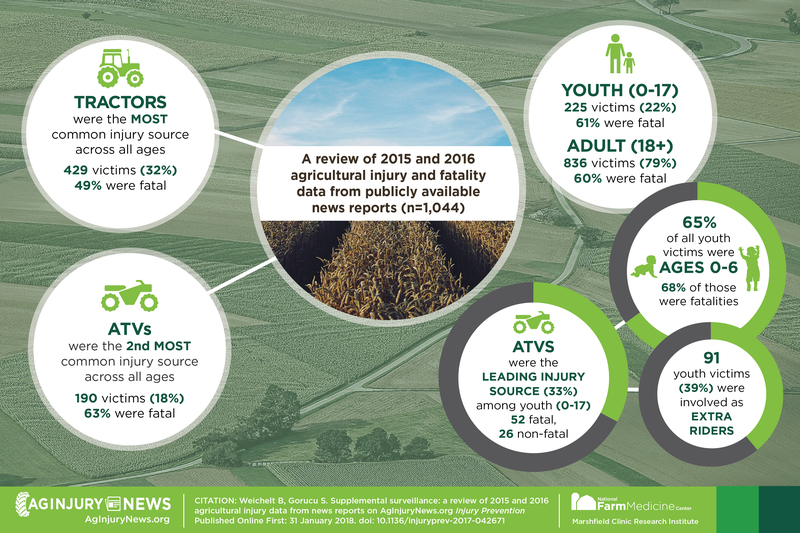 In the absence of a national surveillance program for agriculture-related injuries among U.S. adults and children, news media and similar reports have become increasingly valuable for ag safety stakeholders. AgInjuryNews.org has more than 350 registered users. To create an account, visit www.AgInjuryNews.org and click “Register”. A new version of AgInjuryNews.org is scheduled for release in June 2018. In addition to adding international data, the site will include more options for searching and filtering, data visualization, and customizable email delivery of reports. Funding for this project was provided by the National Institute for Occupational Safety and Health, the Agricultural Safety and Health Council of America, the Marshfield Clinic Research Institute, and the National Farm Medicine Center.